Today, I’d recognize that sound in the first two seconds, but 50 years ago, it was totally alien to me. It was high pitched and guttural at the same time, the smooth, even roar of a gasoline-powered monster, a 1650 hp supernova on a leash. The first time I heard it, I was busy finding and putting out root fires far north of the Arctic Circle in Alaska, about 300 miles from any place with a name you might recognize. (You have heard of Anaktuvuk Pass, haven’t you?) I was part of a fire crew mopping up after a forest fire in the southern Brooks Range. It was about 9:00 p.m., but the sun was still up, apparently delighted at shining all day and what would normally be all night. The fierce sound grew in intensity, mechanical love made audible, even more so when its source became obvious. It was a 12-cylinder Merlin engine, busily converting fuel to noise in a P-51 Mustang, coming straight at me. The pilot was flat-hatting at about 50 feet AGL, probably terrifying the local grizzlies and caribou, and happily consuming sky at perhaps 350 mph. Thank you, God, I thought, as the Mustang sliced past me and pulled up into a glorious chandelle, then dove back down for another pass. It didn’t go unnoticed that the entire airplane was painted bright pink, and I caught a flash of the name “Pink Lady” stenciled beneath the barely PG-rated nose art. For a college kid on summer vacation from the University of Alaska, the Pink Lady was a brief, but welcome respite from a 12-hour day of hard work. I was looking for wisps of smoke in the above-ground root structure of burned-out trees in the permafrost of the local muskeg. One of four students who had elected to fight fires May through late September, I was trying to scratch up enough money to pay for the fall semester. I learned later that this particular Mustang had been sold as surplus after WWII, then somehow reacquired by the government when the Bureau of Land Management needed a recon airplane to help coordinate firefighting. 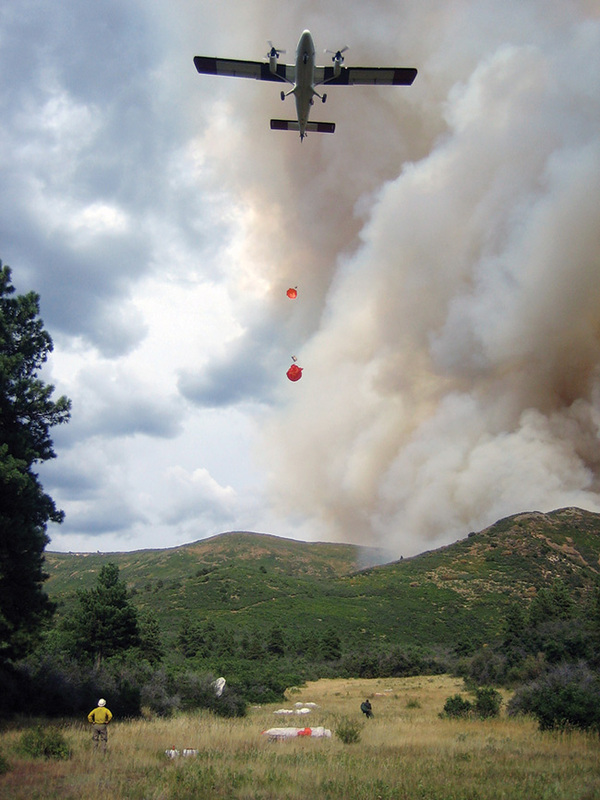 BLM had about a dozen airplanes at work during the summer fire season, mostly amphibious singles and twins dedicated to positioning fire crews as close as possible to fires. The Mustang helped coordinate with base on crew and equipment needs, and because it was so fast, it could oversee three or four fires a day to help locate hot spots, relay requests for additional equipment or personnel, and generally position and help manage the needs of firefighting crews. If BLM needed more range, the airplane had hard points beneath the wings to mount aux tanks. Over the next three months, I hung around the Fairbanks fire base in hope that I might find an opportunity to snag the rear seat on a recce flight. I almost made it, too. The guy who was supposed to fly observer in the Mustang’s rear pit was sick one day, and BLM preferred to have someone in the Pink Lady’s rear seat who knew a little about aviation. I knew as little as anyone, so I stepped up and volunteered. Sadly, the regular observer showed up a few minutes before launch and refused to accept my offer of $50 to discreetly return home and nurse his cold. Bummer. Like most civilianized Mustangs, Pink Lady had the rear, 85-gallon fuselage tank removed and a tiny, suitably uncomfortable seat installed in its place, no engine or flight controls in back—just radios, a shoulder harness and a narrow, tapering, bubble canopy to bump your helmet against during one of the best rides you could ask for. I saw Pink Lady perhaps a dozen times over those three summers, and the pilots always gave us ground-pounders a mini-airshow, mostly because we were in the middle of nowhere, and there was no one around to tell them they couldn’t. Most of the pilots were also war surplus, and they were overjoyed to be allowed to fly a properly maintained Mustang without being shot at. With support from the P-51, a few ratbag DC-3s, three tired and rusty Grumman Gooses (Geese? ), a handful of Cessna 180s on floats and a few other marginally airworthy machines that were older than their pilots, fire crews could stay on scene for up to 10 days, the BLM’s legal limit, and, boy, were we ready to come home after 10 days in the boonies. Airplanes handled practically every mission in the Alaskan bush, sometimes para-dropping supplies or smoke jumpers, often transporting firefighters to the nearest lake, river or stream (and, occasionally, even getting back out without breaking anything), hauling provisions and beer to a tired team in the truly shaggy tundra and performing other tasks you might not believe. We were frequently amazed at what the BLM airplanes and pilots could do. Fighting forest fires in Alaska was a little different than in the Lower 48. We had no on-scene air support from tankers of any kind, and the dedicated Canadair CL-215 water bomber was still 10 years in the future, quietly gestating in some designer’s brain. The Navstar satellite system (better known as GPS) was also far in the future, so directions to a “smoke” were usually simple; fly 11 miles west of the village of Chignik and look for the bend in the east/west creek. There were probably less than 1,000 miles of paved highways in Alaska at that time, but there were many thousands of miles of dirt. During summer, after the seasonal rains had come and gone, dust from those roads covered everything. Conversely, most of the ground was permafrost below about a foot or two, so the thaw of late spring/early summer would leave standing water everywhere. Add to that the fact that the trees had figured out their roots couldn’t grow vertically down through the permafrost, so the aforementioned root structure was above the surface. A burned-out tree might still be barbecuing itself under the leaves of tundra with roots that snaked 20 feet or more horizontally in all directions. If you didn’t cut out every smoking root, you might have to come back later and fight the fire all over. Lightning often started fires in remote sections of the 586,000-square-mile territory/state, and when we flew out to fight a reported fire, we’d sometimes see from the air that another one nearby had burned for what must have been a week or more and finally burned itself out after immolating 100,000 acres. There were no satellites looking down on us in those days, so much of the time, no one even knew it had happened. Firefighting was such big business in Alaska that, every year, we had professional firefighters fly in from Canada, Sweden, Norway and other points international, work through the Alaska dry season and fly home. These guys were pros, and they were paid accordingly, but their presence was more appreciated than resented. As of January 1, 2016, Senior Editor Bill Cox has logged some 15,100 flight hours in 321 types of aircraft. He currently flies a LoPresti Mooney. You can email Bill at [email protected]. I remember back in the mid 60’s at Merrill field there was a Pink P-51 tied down at the entrance to the field next to the coffee shop. It’s name was the Pink Lady. I wonder if this is one in the same?